I've got something really awesome for you guys today! Our business partner AIC, a creative agency, and Bitrix are finishing work on an App that allows you to use Bitrix24 and Bitrix Intranet in your iPhone or Android-based mobile device! Bitrix24 is still in 'beta', but we're planning to have it out of that phase by the time our mobile app is ready. And that's going to be very soon! This is very important for Bitrix24 because we strongly believe that in the nearest future most people's daily tasks will be accomplished through a mobile device. I manage my tasks and communicate with my colleagues from different departments and offices through Bitrix24 every day. 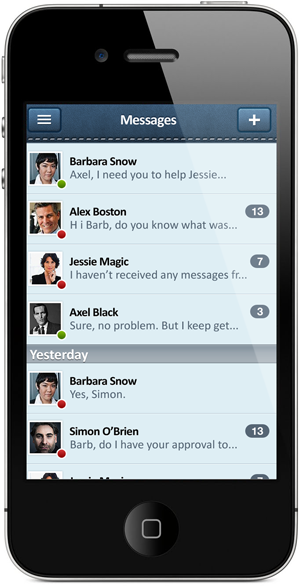 But heaven knows how I need the mobile version of Bitrix24 to in touch with my colleagues, clients and business partner! Ok, here is the plan. After our free App goes live, you'll need to find it in the App Store or in the Android Market and install it on your mobile device. I've prepared several screenshots and photoshop'ed them with an iPhone 4s case so that you have a better understanding of what we're working on. First of all, you need to get authorized. You can use this free app to get connected to your Bitrix24 or to your on-premise Bitrix Intranet (www.bitrixsoft.com/intranet/). There you go! The main page of your intranet appears on the screen. Now you can read the latest news in your personal Activity Stream. Using your mobile device, you can post comments, like posts, and add to favorites. Just a single click - and you open the main menu to start the navigation on your mobile intranet. One of the biggest challenges we're facing right now is the real-time delivery of 'Push' messages and portal notifications to intranet employees. Instant messages and conversations with attached documents and images are no longer the privilege of desktop or laptop users. You can be fully equipped for fulfilling your business tasks even if the only thing you have at your disposal is your mobile phone. We're making the final adjustments to the mobile app right now, so that means that your mobile intranet will be available very soon! Stay tuned!